I wanted to turbocharge my development cycle of OpenStack running on Fedora 18 so I could be waiting on my brain rather then waiting on my workstation. I decided to purchase two modern solid state drives (SSD) and run them in RAID 0. I chose two Intel S3500 160 GB Enterprise grade SSDs to run in RAID 0. My second choice was the Samsung 840 Pro which may have been a bit faster, but perhaps not as reliable. Since OpenStack and DevStack mostly use /var and /opt for their work, I decided to replace only /var and /opt. If a SSD fails, I am less likely to lose my home directory which may contain some work in progress because of the lower availability of RAID 0. For a baseline my system is a Hewlett Packard Z820 workstation (model #B2C08UT#ABA) that I purchased from Provantage in January 2013. Most of the computer is a beast sporting an 8 core Intel Xeon 35-2670 @ 2.60GHZ running with Hyperthreading for 16 total cpus, Intel C602 chipset, and 16 GB Quad Channel DDR3 ECC Unbuffered RAM. Unfortunately the disk is a pokey 1TB 7200 RPM model. The hdparm tool shows a pokey 118MB/sec. 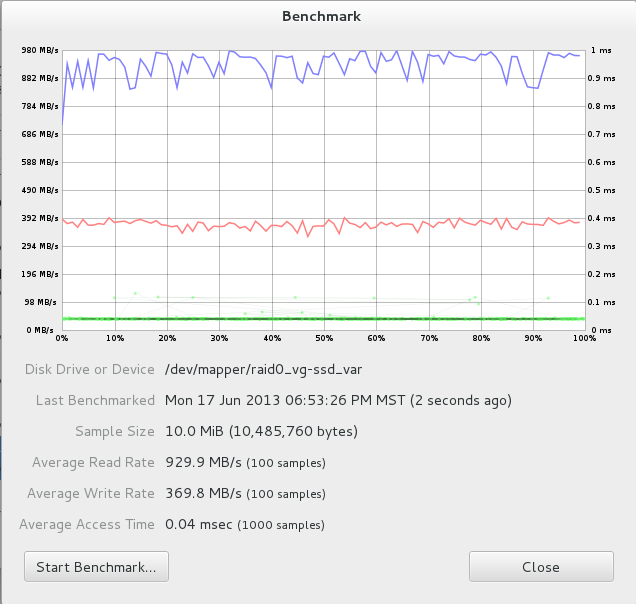 Warning: I didn’t run this benchmark with write enabled, as it would have destroyed the data on my disk. I timed a heat stack-create operation at about 34 seconds. In a typical day I may create 50 or more stacks, so the time really adds up. 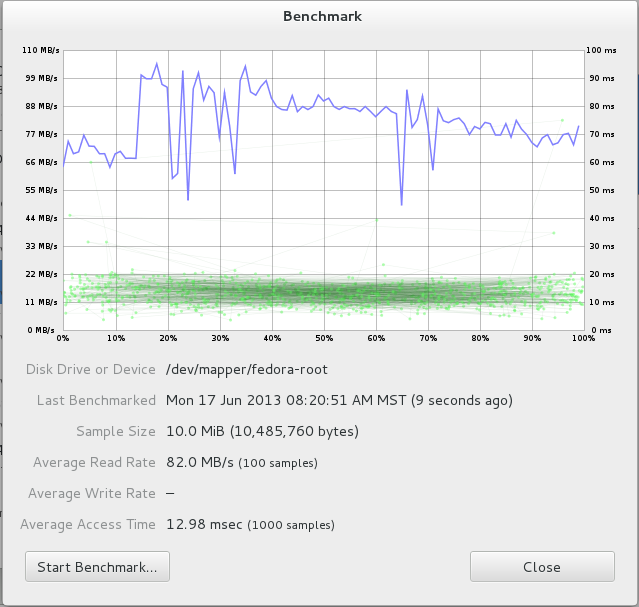 After installing two SSD devices, I decided to use LVM raid 0 striping. Linux Magazine indicates mdadm is faster, but I prefer a single management solution for my disks. I timed a heat stack create at 6 seconds. Comapred to the non-ssd 34 seconds, RAID 0 SSDs rock! Overall system seems much faster and benchmarking shows it. This Post was posted in Software Development and tagged fedora, openstack. Bookmark the permalink.